See HERE to read my review on The Lion, the Witch and the Wardrobe. The following reviews are added as I read along. This is the third book in the Narnia series, and it is similar in style to the second: The Lion, the Witch and the Wardrobe. Shasta, a young slave boy escapes from his master who intends to sell him to a Tarkaan. All his life, Shasta has longed to travel North. Imagine his luck when he finds the Tarkaan has a talking horse who comes from the northern land of Narnia! With the help of his new friend, he embarks on a journey towards freedom and Narnia. Lewis' writing style is in a way similar to Tolkien; both writers, when the journey splits into two different parts, often follow one thread only to come back and recount the other thread from the same point. In The Chronicles of Narnia, this device makes the story seem both long and short. Long because the journey part is repeated so often that we long to get to the part of action, and short because the books themselves have very little story besides the journey and can only be prolonged so much. The dialogue at times seems too formal, even for a fairy tale book for children. This seems like too much criticism, especially with the fact that I actually enjoyed reading it! I liked this one much better than the 3rd installment of The Chronicles of Narnia. It went at a much faster pace and I didn't seem like I was constantly going back to where another character was still behind in the story. The four siblings appear again in this novel and are at the age in which they constantly fight and nag at each other. We are introduced to Prince Caspian, (by the way, there is no developing romance between Susan and Caspian mentioned in the novel - that is added to the movie) the true King of Narnia who is fighting for his right against his Uncle. One thing that I enjoy about the series is the little lessons given to each character; none are exempt from the lion's scolding. Lucy is the obvious favorite in the novel and the one to whom Narnia was first shown, but whenever she is in the wrong, she is shown how. All the children pray a pretty homage to Aslan, the King of Narnia. I liked seeing how they all respected him, and joy burst into their hearts whenever they saw him. Fantasy is not necessarily a good thing. Peter, Susan, Edmund and Lucy love Narnia and it has certainly taught them something, but once in their own world, they can't help feeling discontented and yearning for the glory and position they had attained as Kings and Queens in Narnia. Reading this book I was amazed at the differences between the movie and the book. Although the story goes along the same lines, the movie has incorporated much more action. Most of the scenes are embellished and carried further than they were in the book. For example, when Eustace turns into a dragon, none of the Narnians fight him, Lucy doesn't speak the incantation to make herself beautiful, she isn't kidnapped by the Dufflepuds, and when they go into the land where dreams come true, they come out unscathed without anyones dream becoming a reality. The movie makes all these things happen so as to make the story more dramatic. The book didn't have a strong plot which is perhaps why things were changed in the film. From the simple voyage of discovery the book had laid out, the movie became a quest to save the seven lords and collect their swords which held some magical power. With all four of the Pevensie children gone, this book was like a shock. The withdrawal had been gradual with Peter and Susan going first, but the loss of all of them was still too great for The Silver Chair to be a success. To top it all off, we didn't even have Prince Caspian except in passing as an old and heartbroken king. Although Eustace's character has improved in this book, there are still plenty of lessons that Aslan has to teach the children. We have a new character, Jill Pole, who comes along for the journey. Their quest is to rescue Prince Caspian's (now an old king) son from a witch. The children are shown as what they are - children; easily annoyed, irritable and sometimes quarrelsome, caving into wants and needs. The book was natural and the learning process was gradual. 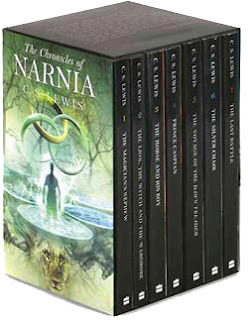 The last of the Narnian series, this book reveals the truth about Narnia, Aslan's country, and the whole magical kingdom. Narnia is breathing its last when King Tirian calls for aid. Aslan answers and sends Eustace Scrubb and Jill Pole. Together they prepare desperately for the last battle. The end of Narnia is near and it looks like there is no hope. All of a sudden, all the characters who ever came into Narnia from the "other world", are assembled together (sadly, except Susan!). Aslan appears and before their eyes a country is laid to waste, thousands of years pass, the sea sweeps over all, the sun dies, and the door is closed on an eternity. I loved the depiction of Father Time and how the world ended was beautifully portrayed. I read each and every word of the description. When the characters gather together at the end for a final talk, I was disappointed. I liked the idea that the world they were in now was supposed to be the real world, and all others just a paper copy (even the England they had lived in, and the Narnia they had ruled over, was never the real England or Narnia), but the way things ended, and how Peter, Edmund, Lucy and the rest got there, seemed wrong to me. Some questions remained, and although the world was beautiful beyond dreams, I couldn't help wondering about all the other people over in the 'fake' England! I didn't finish the Narnia series after I heard how it ended. It just felt wrong to me! Same here. It was just so wrong!